Remember that old story about the Good Samaritan? A traveller is brutally attacked by thieves and left for dead at the side of the road; people pass by without helping; a kind stranger comes to the rescue. I never imagined how my life would fit into that story. I was travelling peacefully along the road of my life until the age of 49, when suddenly I found myself under attack, surrounded by thieves. It wasn’t my money they were after, it was my peace of mind. And the thieves weren’t people, they were horrific accounts and images of human violence against animals. All the layers of self-protection that I had wrapped around myself all my life were stripped away, and I fell to the ground at the side of the road. I could no longer go on. I was desperately wounded. But here we are on a beautiful day at a happy place. Why bring my woundedness to Vegfest? Why not just take today to celebrate? It’s World Peace Day, after all. The reason we can celebrate today is the very reason that we can’t just celebrate. Yes, let’s feel the joy of our connection with all living beings! Yes, let’s encourage each other to align our lives with that awareness! But no, we can’t forget why we are here; animal suffering is the dark undercurrent beneath everything we are doing here today. We pay a price for our awakening. Once we have seen, we can no longer be people who have not seen. The world is different for us now, and always will be. The suffering of others has wounded us. For all the joys of a place like this, in the midst of all the celebration, there is that undercurrent of painful awareness. We pay a price for awakening: we begin to love. And because we love, their suffering has become our suffering and sometimes we find ourselves lying wounded by the side of the road. And now the old story picks up again, as the people in our lives begin to pass us by. They can’t afford to come too close to our pain. They sense the danger, all those horrors lurking just around the corner. No one wants to have their self-defences stripped away; no one welcomes having their peace of mind assaulted! And there is something else our friends and family sense as well: if they accept the emotional risk of seeing and tending to our wounds, they know that their own journeys can’t help but be affected – they will have to change the direction of their lives, and they will have to pay a price. And so we may find ourselves feeling more alone than ever before in our lives, our loved ones keeping their distance from our pain, and we in turn hiding our wounds from them. Perhaps we keep the “peace” by smiling when we feel like crying; perhaps we cover our vulnerability with the protective armour of reason and argument; or perhaps we just turn away. There are so many ways of turning away. We pay a price for loving: we are torn between loves. For all of us who care about the suffering of animals, this is a real and painful dissonance in our lives. For some of us it is part of our consciousness every single day. 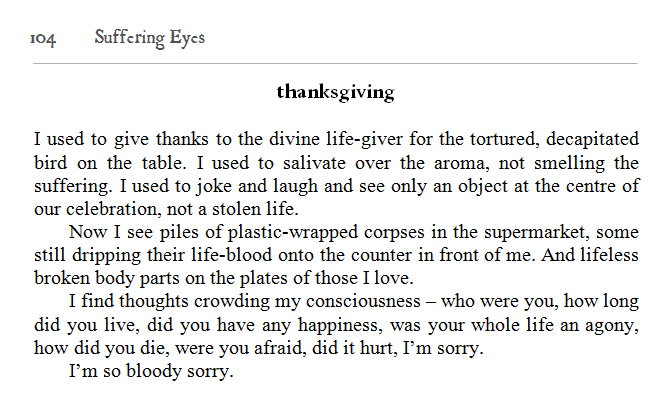 Before our very eyes, our loved ones consume the bodies of our other loved ones. It is unbearable, yet we must bear it. And when we look instead at ourselves, we see that no matter how hard we try, we can’t help being complicit in the whole mess of suffering around us. The knowledge of this is unbearable, and yet we must bear it. And so we lie by the side of the road, the wounds of our love becoming infected by hurt and guilt and blame. Awareness of our connection with all living beings, has somehow begun to disconnect us from the particular living beings we are closest to. We pay a price for being torn between loves: we become disconnected. I can no longer bear to attend this kind of meal. Sometimes I am the only one who stays away. This is what it means to be torn between loves. There is a whole range of disconnection, breaking my heart daily. Disconnection from grocery store workers oblivious to the misery of lobsters, from friends telling fishing stories, from loved ones conducting animal research. And then there are those other stories. The great disconnects. The unimaginable horrors. The million pigs buried alive. The routines of slaughterhouses. The deliberate cruelties. And in those disconnects, there is more than sadness for me, there is RAGE, rage for loved ones being brutalized before my eyes. Rage, that wild emotion with the power to mobilize the body in an instant, to act NOW. Except that as I witnessed this violence, I couldn’t act, there was nothing I could do. What I was seeing and hearing had already happened – I could do nothing to protect those individuals from the unimaginable suffering they had already endured. As I witness deliberate cruelties inflicted on helpless and innocent creatures, as my body trembles with grief and rage, it is hatred that I find rising up inside of me. Hatred, the root of violence, is in me too. It rises like bile in my throat, choking and poisoning the love out of me. I know that the only way to turn this world towards mercy is through love and not through hate, but how can I hold on to love in the face of what I have seen? We pay a price for being disconnected: we begin to hate. And every single one of us knows the price we pay for hate. We have to stop the downward spiral. We have to. We can’t afford to let the war against suffering be sabotaged by guilt, blame, division, and hatred. We need to devote everything we are to changing everything, yet we must do this while preserving and nurturing our connectedness with everyone, otherwise we won’t have changed anything. This seems an impossible task - how can solidarity with the victims not result in alienation from those perpetuating the abuse? This is not a theoretical question – it confronts us every day. It compromises our wellbeing, infiltrates our relationships, and critically impacts our work to alleviate animal suffering. So how do we hold on to love in the face of what we have seen? I don’t have an answer to this, I haven’t figured it out. I have no words of wisdom that will resolve the dilemma once and for all. All I have is the repetition of the question, every single day, in every moment that it is required of me: how can I hold on to love today, in this moment, in this situation, with this person? Each of us has to hold on to love with everything we’ve got. A more merciful world is at stake. I chose to talk about love here at Vegfest, because this is where the love is! So much love all around us, so many facets of it, connecting us with each other and with all living beings. 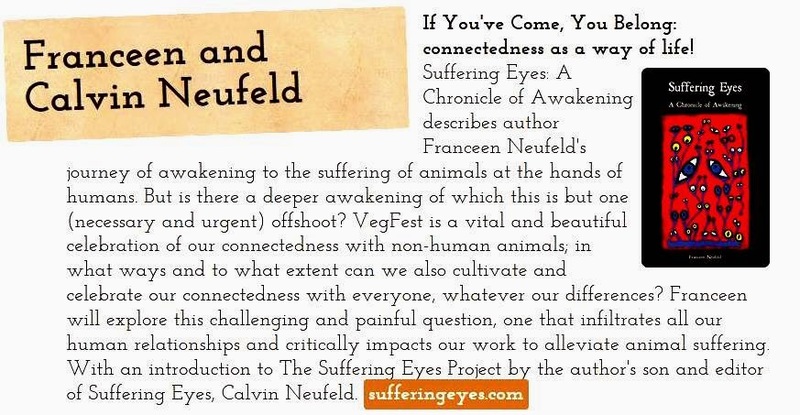 Vegfest bears witness to the truth that every individual who has come into being on this planet, shares a bond of “relatedness and mutuality” [Hall 127] – we all belong, and we are all connected. The question is, how do we live into that truth? Our awakening to the suffering of animals at the hands of humans is a necessary and urgent offshoot of a deeper awakening, one that opens our eyes to a simple truth at the heart of everything. It is this: we are all connected, and the only thing that makes that a good thing is love. Love is not an emotion and it is not a weakness – it is the only force for good there is in the world. Love takes whatever form it needs to take for rescue’s sake. Where there is darkness and ignorance, love is light and truth. Where there is suffering, love is comfort. Where there is vulnerability, love is shelter. Confronted with injustice, love is anger and resistance. Where there is enslavement and brutality, love intervenes to rescue and defend the oppressed. In all of its forms, love is, in the words of theologian Doug Hall, “exceptional and deliberate solidarity” [Hall 186]. And that is the only thing with the power to make our connectedness a good thing. But we undermine this solidarity anytime we exclude anyone from the circle of belonging and from the reach of our love. And so back to that old story. It has a happy ending. Someone stopped to help, and it turned out to be the least likely person of all. Which was the whole point of the story. Who is this neighbour that we must love? Anyone. Everyone. There is no “us” and “them” – there is only “us” – “life giving itself to life” [Schweitzer], and love doing whatever love needs to do for rescue’s sake. I never imagined how my life would fit into that old story. For most of my life, I was not the wounded traveller. I was not the Good Samaritan. I was not even the people passing by without helping. For the first 49 years of my life I was the thief – I stole countless innocent lives and wounded the happiness of the beings I now love and care for. But now I am also the wounded one, because I love, because I let their woundedness wound me. And I am the Good Samaritan – I am on a mission of rescue. God gave me two eyes, two ears, two hands, two legs, but He only gave me one heart. If he had given me two hearts, maybe I could use one to love and then reserve the other one when I have to hate. But he only gave me one, and I'm not going to contaminate and poison that one heart with hatred. May our hearts be used only for love. Love for each other. Love for the animals. Love for the meat-eaters across from us. Love for the butcher. A more merciful world is at stake.